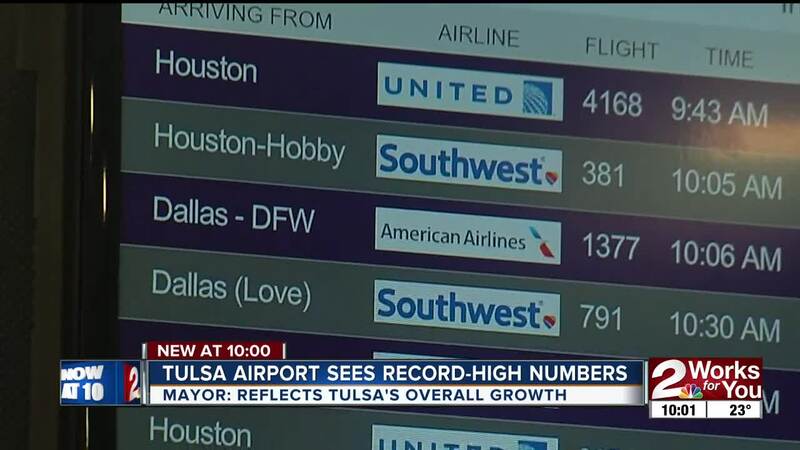 TULSA -- The Tulsa International Airport had more than three million travelers come through in 2018, making it the busiest year in a decade. Passenger activity at the Tulsa International Airport jumped more than six percent in 2018. "Anywhere from once a month to twice a month, fly for business and for pleasure," said Mark Hinton, who was traveling at the airport. The travelers Two Works For You spoke with say the Tulsa airport is cleaner than others, and easy to get through. "It’s smaller, I’m from Denver, the Denver airport is a zoo, you can get out of here really quickly," said Hinton. Airline capacity increased in 2018 with Frontier Airlines returning to Tulsa, and Via Air launched nonstop flights to Austin. "We now have more options we have more economic activity, and all of that blends into more flights," said Mayor G.T. Bynum. Mayor Bynum says it's not only business opportunities bringing in more travelers to Tulsa. "We landed the two largest new employees in the city of Tulsa in the last year and a half," said Mayor Bynum. He also credits the increase in attractions, like Gathering Place, which welcomed 300,000 visitors in the first month. "We expect over a million people in the first year to see the Gathering Place," said Mayor Bynum. Airport officials say the FlyTulsa campaign also helped bring in more travelers. Nearly 50 companies pledged to fly from Tulsa, versus driving to surrounding airports.